Letter signed by Australian, Canadian, Indonesian, Mexican and South Korean leaders raises pressing issues which need to be addressed at the G20 summit to restore global economic confidence. 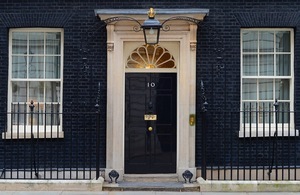 The Prime Minister has signed a joint letter responding to President Sarkozy’s statement yesterday in New York that it should be a G20 priority to “help the world find the path to growth”. The letter has been signed by Prime Minister David Cameron, along with Prime Minister Gillard of Australia, Prime Minister Harper of Canada, President Yudoyono of Indonesia, President Calderon of Mexico and President Lee of South Korea. the completion of a trade deal would provide a strong economic stimulus. Well, I think what needs to happen is every country has got to face up to its own problems and difficulties and deal with them, whether that is debts in the Eurozone, whether it is problems in banks, whether it’s dealing with our deficits - every country has to do that. And that’s why I’ve come together with leaders of countries in the G20 but as diverse as Mexico, Canada, Australia, South Korea and signed a letter to President Sarkozy, who’s leading the G20 this year, to make exactly that point - face up to the debts, to face up to the deficits, face up to the problems. Every country in the world has got to do that in a coordinated way so we can get growth moving. We fully support your call yesterday that the priority of the G20 must be to “help the world find the path to growth”. We will give our full backing to your Presidency in achieving this at the Cannes Summit in November. We need decisive action to support growth, confidence, and credibility. We have not yet mastered the challenges of the crisis. Global imbalances are rising again. External risks to the stability of our banks and our economies are reaching pre-crisis levels. And volatile and high energy prices are hurting our citizens and acting as a drain on world growth. At the same time, the confidence of citizens, businesses, and markets has been damaged due to the lack of visible political will: this in itself is holding back the recovery. Over the summer, the difficulties encountered in finding a durable solution to sovereign debt problems have further affected confidence. The G20, representing 85% of the world economy, is our platform to address these challenges. Under your leadership in Cannes, we have the opportunity to commit to each other to take the actions we know are necessary. We must agree the hard policy decisions we should each take, validating our actions against strong objective analysis and recommendations from the relevant international institutions. And, within the Framework for strong, sustainable, and balanced growth agreed in Pittsburgh, we must each act on those decisions. Only when we work together can we restore strong growth and the confidence on which it depends. The priorities are clear.We must increase global demand without once again creating unsustainable global imbalances. Surplus countries need to increase their expansion of domestic demand, enshrining their policies in clear political commitments within the G20 including on structural reform, to keep markets open, increase exchange rate flexibility and refrain from competitive devaluation. Deficit countries need to find new sources of growth, including making clear commitments now to put in place specific structural reforms necessary. They need to restore competitiveness and improve the underlying performance of their economies. Eurozone governments and institutions must act swiftly to resolve the Euro crisis and all European economies must confront the debt overhang to prevent contagion to the wider global economy. The July agreement to strengthen the Eurozone Financing Facility was an important first step. Euro countries now need to ratify this agreement as soon as possible, alongside implementing reforms to deal with excessive deficits, improving economic competitiveness, and acting now to strengthen banking systems. The Eurozone must look at all possible options to ensure long-term stability in the world’s second largest international currency. Countries with long-term debt problems must put in place and implement credible growth-friendly medium-term fiscal consolidation plans, differentiated according to each country’s own national circumstances. The United States, as the world’s largest economy, also has an important role to play in restoring confidence. The August bipartisan deal lays the foundations for a deficit reduction plan and President Obama’s jobs plan will help provide a welcome impetus to growth in the short term. The US, along with other high deficit advanced economies, needs to overcome the remaining hurdles towards restoring medium-term fiscal sustainability. The failure to date to conclude a global trade deal is robbing the world of a much-needed economic stimulus. It is also affecting public confidence in our ability to deliver what leaders have promised to do repeatedly. We should agree in Cannes a credible plan to take to the WTO ministerial in December as a basis for concluding the Doha Development Round. If we cannot agree this we should direct our Ministers to consider innovative approaches to deliver progress in a multilateral trade deal and strengthen the multilateral trading system. International trade can be the engine of global growth and development and we must keep it moving forwards. In taking forwards all these actions, the G20 must also take a path toward all-embracing growth, supporting economic development that will help reduce global disparities. The barriers to action are now political as much as economic. We must send a clear signal that we are ready to take the actions necessary to maintain growth and stability for all for the future. The G20 showed at the height of the global financial crisis that we could work together to deal with global instability - the Cannes Summit is an opportunity for leaders to prove this, arrest the slide in confidence, and strengthen the foundations for strong, sustainable, and balanced global growth for the future.